If you ask someone to name the most iconic critter in the state of Maryland, they will likely answer with the blue crab. With its brilliant claws, beautiful color and savory taste, the crab is a titan of tourism that adorns everything from t-shirts to keychains. However, right behind the blue crab is a bivalve that could rival it for the crown: the oyster. An oyster is a mollusk, a creature with two rough shells that enclose a soft body. A versatile delicacy in the culinary world, the oyster can be fried, frittered, grilled, seared, eaten raw and even taken as a shot with spirits. The oyster defines regions, taking on the taste of the waters in which it lives to have a nuance of flavor all its own. As one would take a tour of vineyards, the Chesapeake offers unique boat trips to oyster locales and even an oyster trail. 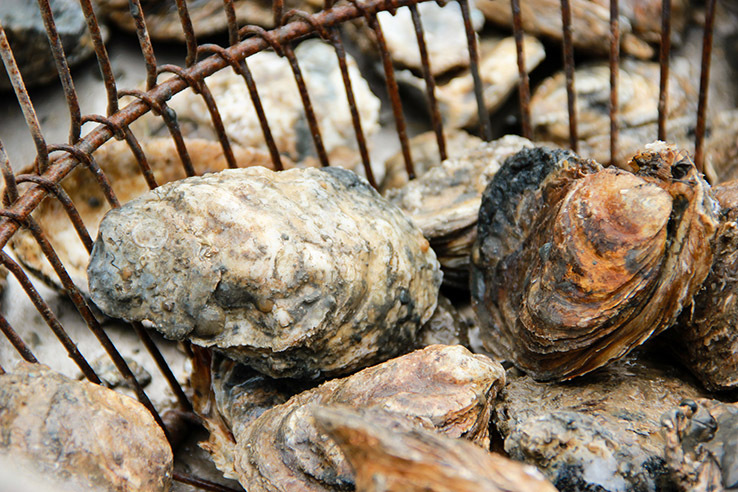 Viewed commercially or culturally, oysters are one of the most important catches in the region. In addition to its place of honor in a seafood feast, the humble oyster also packs a punch as a formidable foe to pollution. By pumping water over its gills, an oyster traps particles of food as well as unwanted nutrients or suspended sediments from the water. One adult oyster has the capacity to filter 50 gallons of water per day, helping to naturally clean our brackish waterways. Despite their importance across industries, oysters have declined due to habitat loss, over-harvesting and deadly diseases. 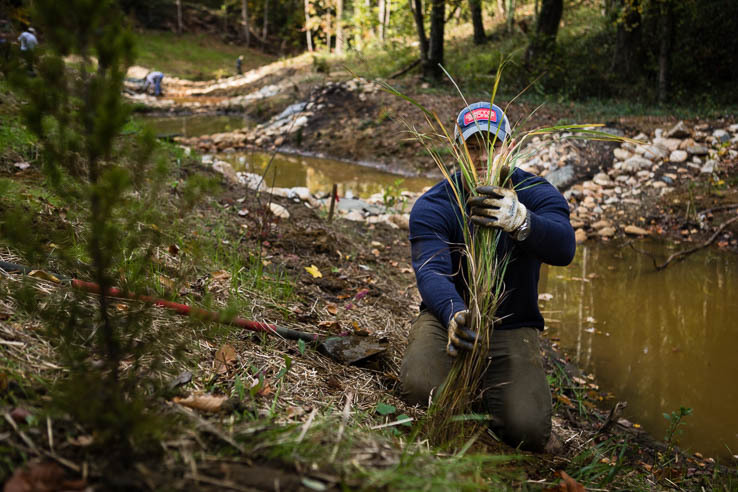 With such an iconic species in peril, the state of Maryland is working to restore their populations. One way they do this is through a grassroots effort called Marylanders Grow Oysters, in which people from every background pitch together to nurture baby oysters to adulthood. The concept is simple: in a state where much of the shoreline is privately owned, waterfront property owners are given cages, spat and the training to grow millions of young oysters right off their own pier. After being protected by people during their vulnerable first year of life, the oysters are planted in local sanctuaries to enrich the ecosystem and the oyster population. Marylanders wholeheartedly agreed with Judy from the start, and liked the concept of hands-on learning. 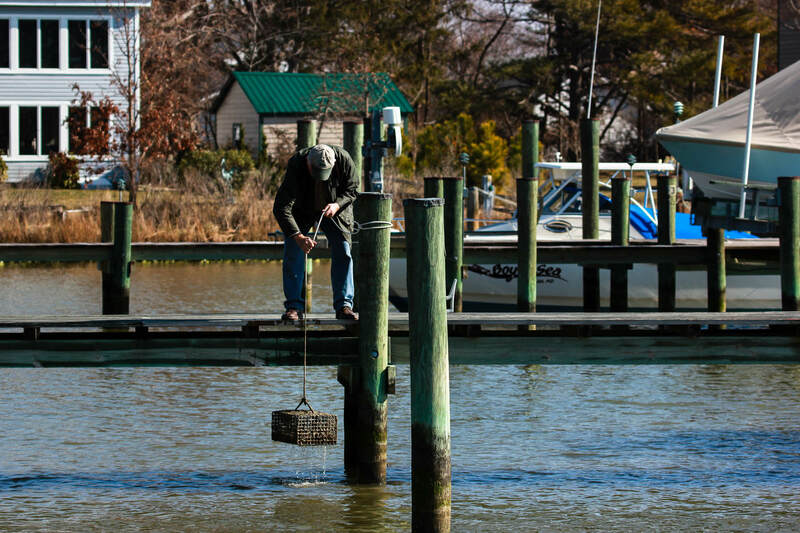 The Talbot County government partnered with Marylanders Grow Oysters to reach waterfront owners through a mailer, and since then participation has spread by word of mouth. 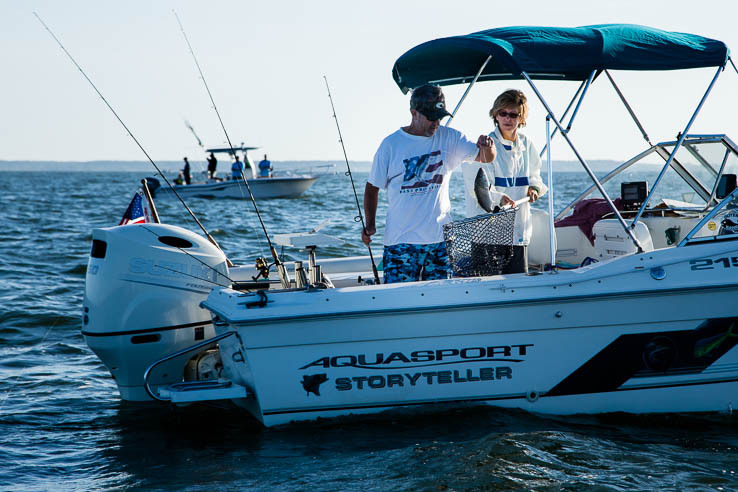 “The Department [of Natural Resources] launched it, but it is only successful because of a massive team effort,” states Judy emphatically, going on to describe the enthusiasm and involvement from all over the Maryland population. For the first six years of Marylanders Grow Oysters, inmates crafted the cages through a Maryland Correctional Enterprises program. Though they may look simple, there are certain aspects of the cages that have to be done just so. “They did a perfect job, excellent job,” says Judy with pride. “Working with the prison system was great, meeting the men …and the cages were spot on.” As he explains, many of the inmates involved in the project had grown up on the eastern shore and therefore felt the personal connection to the effort and a sense of pride in contributing to something of value. Oyster cages right off the pier become micro reefs of an interconnected system, and that diverse network is mirrored in the people who care for the oysters in that crucial first year. In addition to the growers and departments, the hatchery at UMCES Horn Point Laboratory produces the spat for the program. Several watermen across local waterways are closely involved, pitching in with their boats and equipment to help neighbors when the nine months are up and it is time for oysters to be transported to their local sanctuary. Thousands of schoolchildren across the tributaries take up the call to tend the cages, which require shaking several times a week to ensure silt does not stress the young oysters. Excellent work and a great way to raise awareness. Our small community has several docks and sea walls where similar could be done. I was thinking about using old crab traps partially filled with clean shell and a few live adult oysters. Hoping the adults would proliferate and the young attach to the shell in the trap. Not certain spat would be available in our area. Thoughts? Most of the time, oysters are picked up as spat in the fall to grow under the guidance of someone like you, then collected at the end of May or beginning of June to be planted on a reef. The local sponsor for your area may have some oysters still available at this time of the year - the best thing to do would be to ask Marylanders Grow Oysters. This link can answer some of your initial questions on getting started. Eric Campbell, the Marylanders Grow Oysters program manager, can help you to get involved in your local area. You can contact him at eric.campbell@maryland.gov. Good luck with your new oysters! Is it too late to take some of the spats to grow for this season? One oyster filters fifty gallons of water a day! A little service and stewardship goes a long way. Thanks to everyone that helps clean the Bay!